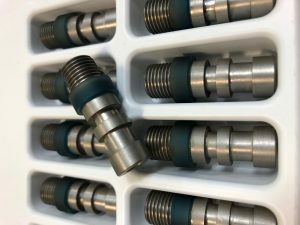 Urethane thread protectors manufactured by Plan Tech are produced using the highest quality standards. Our polyurethane thread protectors are made tough to protect your equipment and valuables from damage and corrosion. Plan Tech’s rubber thread protectors are cost effective and built to withstand extreme environments (-90oC to +90oC). Plan Tech poly thread protectors provide a good gripping surface for better and tighter installation to save protectors from getting lost during the transport of goods. Our thread protectors are resistant to greases, fuels, oils, water, and abrasion. Plan Tech rubber thread protectors absorb shock rather than transfer it. The urethane thread protectors that we manufacture are available for light duty style to protect drill pipe and sub connection and in heavy-duty style for drill collar connection protection. We also offer custom made urethane thread protectors and pressed urethane thread protectors for various industrial applications. Thread protectors are reliable, safe and easy to operate. Plan Tech’s thread protector eliminates abrasion on the threads of the casing pipe and guarantees threaded ends protection against corrosion and stresses that may occur during handling. Where Silicon, UHMW, and Nylon will fail you in resisting Ozone and Oxygen, Plan Tech’s polyurethane’s will efficiently do the opposite – which is, resist Ozone and Oxygen. Are you interested in cast Urethane Thread Protectors? Please Contact us so we can help solve your requirements and work with you on your specific application!